Otoplasty surgery, otherwise known as “ear pinning”, is one of the common head and neck plastic surgeries that we offer in our Manhattan specialty practice. It’s a straightforward procedure that Dr. Rousso performs on patients of all ages of both genders. Why is an otoplasty something you may want to consider? Nobody wants their child to be made fun of. Maybe you were fine growing up with the same ears that your uncle is known for, but you would like to spare the trademark look on your young son or daughter. With our Brooklyn otoplasty treatments, that’s a reasonable goal we can help you to achieve. Various types of genetic syndromes alter our physical appearance. From the positioning and size of our facial features, ears are just one of many areas that may be impacted by underlying medical concerns. Depending on the severity of ear abnormalities, an otoplasty may be a great way to minimize the physical side-effects of particular health conditions. Depending on your hairstyle, large or flared-out ears can be hidden to a certain degree. Maybe you’ve kept your hair the same way for over a decade and it’s starting to look dated, or too thin to hide your ears at all. With an NYC otoplasty we can help you hide the physical characteristic you’ve always felt self-conscious about. 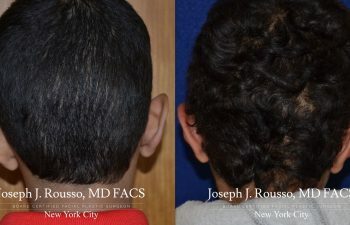 Dr. Joseph J. Rousso is one of NYCs only double certified Facial Plastic Reconstructive and Head and Neck surgeons. If you’re looking for one of the most qualified experts to perform a successful ear pinning treatment, we invite you to schedule a consultation.